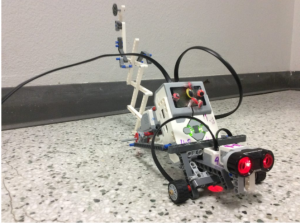 I teach an introductory course using the LEGO Mindstorms EV3 set. My students are 7th graders who are required to take the course and may not necessarily have any background in programming/building. My school is on a trimester schedule so the course runs for thirteen weeks at a time. For this particular trimester I have one class of thirty-three students and one class of twenty-four students. I meet each class for one 50-minute period each day, five days a week. I have thirty-four computers in my classroom, and my school district also has a 1:1 iPad initiative for all students grades 2-12. We mainly use the iPads for programming. I also have one EV3 kit for every two students. 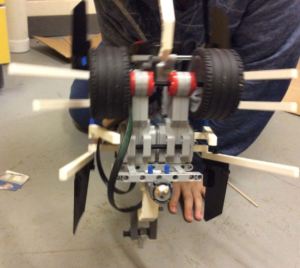 I’ve been teaching this class in its current form for three years, though I’ve been teaching Robotics for seven all together. If you’ve been following this series, you may have noticed that I haven’t posted a new entry for a while. That’s because I tend to teach the same curriculum and had exhausted my best ideas already in this series. 🙂 But I am always trying to incorporate new ideas and projects and this most recent trimester I hit upon using Dr. E’s Challenges. Dr. E’s Challenges are designed to get students building, programming, and sharing their robots with a wide audience based around an ever changing theme. Originally designed by Dr. Ethan Danahy from Tufts University (Dr. E, get it? Yeah, neither did I for a full year and I know the guy) they are now run by Barbara Bratzel and have been running for two years in their current form. 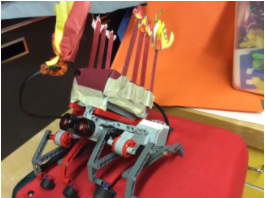 Goal: Create a mythical beast—a dragon, a unicorn, a zombie, or any other imaginary animal. Show us something about your creature—how it moves, what it eats, where it lives. 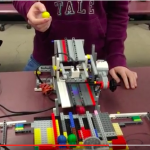 This is a joint challenge for both WeDo and NXT/EV3. Anyone can join – it is not limited to students in a class setting (though it is aimed at kids and young teenagers). 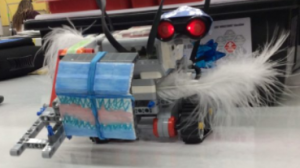 All you need to do is build and program a robot that meets the challenge, take pictures and videos of the robot, upload them and include a write up. And then in true social media fashion, vote for your favorite. I had wanted to do Dr. E’s Challenges for a while, but could never find a way to fit them into my curriculum. I already knew what I was teaching and what projects I was assessing and couldn’t work in a monthly challenge. This year my school term started early, right at the end of August, which meant my second trimester began right at the end of November. I had time to run my students through an introduction to the EV3, had them build Damien Kee’s Riley Rover, and taught them how to use the ultrasonic sensors. Then I had them all sign up for Dr. E’s Challenges – it takes about a day to get approved. And off we went. 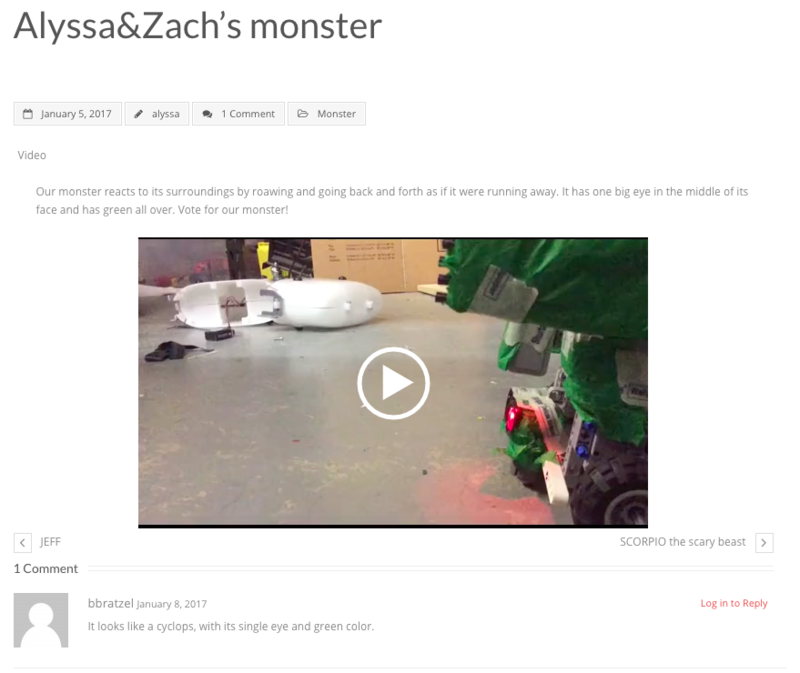 Goal: For this monstrous challenge, create a MINDSTORMS monster. It can be big or small, scary or funny—but it must respond to its environment in some way. I told them they could use any sensor they wanted but I figured most of them would want to use the ultrasonic sensor to “react to the environment” so that’s they one that I taught. If they wanted to use a different one, they could ask me for help. We started in about the second week of December and it took about three weeks to build, test, program, decorate, record a video, upload it and write about it on the website. Unfortunately winter vacation hit, so I emailed Barbara and asked for an extension and she was kind enough to push the close date back to Jan. 6. The three girls in this group took a rather theatrical bent to their video. But the explanation of what their robot does, how it works, and how they made it are great. You can see they decorated it and even built a cave. One bonus (though I hesitate to call it that when it was something I required the groups to do :)) is they were able to show and explain their program. Another video I liked was Widdow. I’ll give my students the benefit of the doubt as to the misspelling as it was a proper name. 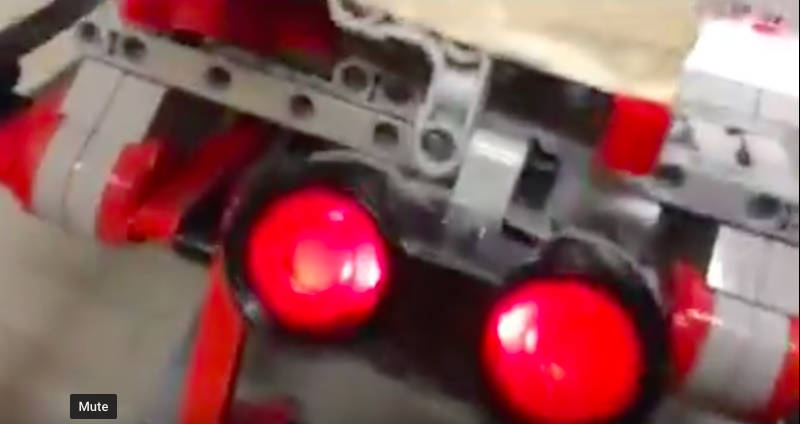 You can clearly see that there was a lot of thought that went into the planning and building of their robot. They are able to really relate what they learned, what they tried, what they wanted to do, and what worked. 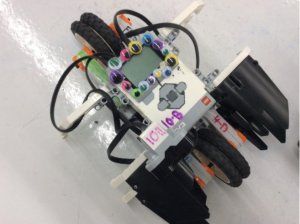 Striker is a good example of a group that wanted to go a little bit further with their robot. They asked me how to make a tail and I showed them an example of a scissor mechanism, but left the details on how to build and attach their own up to them. 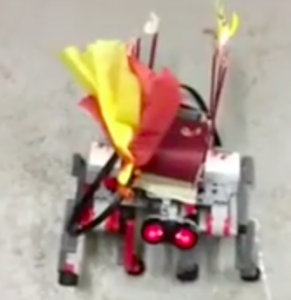 I was totally surprised to see the attachment of their robot’s nemesis, this was the only group to build an “opponent” to their monster that was actually part of the robot itself. The final one I want to highlight is the one that won the voting, and that is Flames of Fury. 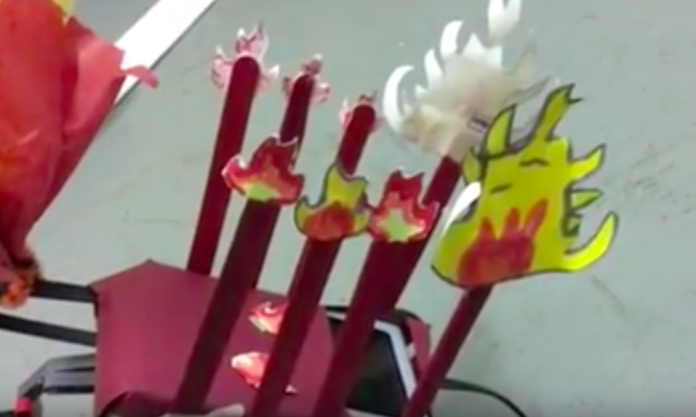 This group created a story, built props, edited a nice video, all on top of having a really cool robot. Though the voting was small, this team received the most and were declared the winners. Their video is now featured on the Fan Favorite page of Dr. E’s Challenges. In addition, Dr. E sent them a letter of congratulations as well as a laser cut wood medallion celebrating the fact that their project was on the Fan Favorite page. I’m glad I did Dr. E’s Challenges with my class. The timing worked and I think they got a lot out of it. The contest was open ended enough and the definition of “monster” was loose enough, that it allowed for each group to create their own expression. Use of a sensor, in both building and programming was required. 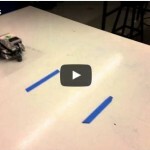 Students were accountable for their work by being forced to make a video explaining what their robot did, how it worked, and how they built it. And they got to see their published results on a website other than my youtube page. If you’re looking for a great way to get your students interested in a new activity, I highly suggest Dr. E’s Challenges. Click the picture above to a link to a playlist of all the robots.